A task list contains of one ore more tasks, separated by a newline. Each task definition may contain ..
Each line of a given input may specify a task, the summary is prefixed by a ‘- ‘ character and when an assignee or labels are given, these are separated from the summary by a ‘/’ character. - First Task / assignee:"joe" labels:"foo,bar,baz"
- Second Task / assignee:"fred" labels:"beer,wine"
Just one dependency needed here: parboiled-java – please feel free to choose your favourite build system here. If you’re interested in grammar building with the scala version of parboiled please skip to the section “Using Scala“. Adding the following entry to your build.gradle is all you need. 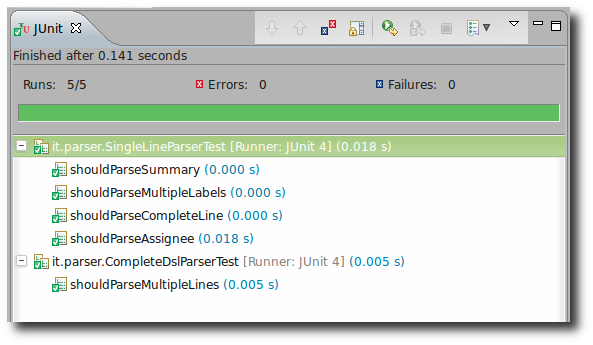 libraryDependencies += "org.parboiled" % "parboiled-java" % "1.1.6"
First of all we’re starting to create a parser for a single line, composed out of different rules. This class encapsules information for a single task and provides getters and setters (returning the task object). This is our first approach for a parser – extending org.parboiled.BaseParser adds everything we need to construct our rules here. Sequence: Creates a new rule that only succeeds if all of its subrule succeed, one after the other. Optional: Creates a new rule that tries a match on its subrule and always succeeds, independently of the matching success of its sub rule. EOI: Matches the Chars.EOI (end of input) character. ZeroOrMore: Creates a new rule that tries repeated matches of its subrule. OneOrMore: Creates a new rule that tries repeated matches of its subrule and succeeds if the subrule matches at least once. TestNot: Creates a new rule that acts as an inverse syntactic predicate, i.e. ANY: Matches any character except Chars.EOI. Ch: Explicitly creates a rule matching the given character. There is a plenty of other methods for your convenience, contained in org.parboiled.BaseParser. You may even use recursion here because Parboiled is able to cache method invocations to avoid infinite loops here. The more complex a grammar or domain-specific language tends to grow the greater the need to write detailed tests for each fragment. Now we’re going write a grammar to parse multiple tasks that should finally return a TaskList containing multiple Task objects. In opposite to the first grammar, we’re using another approach here and make use of the generic org.parboiled.support.Var to pass the task list and the specific task objects around to be filled. Now for a short example in Scala we’re going to construct an abstract syntax tree (AST) using Parboiled’s Scala API. This is my build.sbt with the dependency for parboiled-scala. If you’ve cloned the scala project from my Bitbucket repository and you’re using Eclipse IDE, you might want to need necessary project files by running sbt eclipse. "org.parboiled" % "parboiled-scala_2.10" % "1.1.6"
The following code constructs a simple AST tree covering a task with its summary (I was too lazy to cover all task properties here). The Parser trait adds the different rule operations we need here and the import of org.parboiled.scala._ adds the rest we need here. Please note the special syntax available in Scala in comparison to the Java version .. e.g. to specify a Sequence you may use the ~ operator here, additional syntactic sugar is hidden in the Rule objects e.g. Rule1. Now we’d like to test the results so we’re adding third tasks in a string to be parsed and afterwards we’re printing the summary from the results. Parboiled offers a variety of possibilities here and I’m afraid that I haven’t grasped every detail yet. But if you’re interested in some more complex or real-life examples, I highly recommend to take a look at the Markdown Processor Example (Java API) or the JSON Parser Example (Scala API) or enjoy the detailed documentation on the project’s website here. Thanks @resah for pointing me to this framework! I’m sure that it will make a good match for my toolbox of frameworks and libraries for future usage/projects. This entry was posted on Sunday, January 26th, 2014 at 8:59 pm	and is filed under Development, Java, Scala. You can follow any responses to this entry through the RSS 2.0 feed. You can skip to the end and leave a response. Pinging is currently not allowed.